The demographic growth rate of about 2 per cent per year has put further pressure on natural resources and increased the trend towards migration. For all practical purposes, forest resources have been depleted. Land resources have also suffered the effect of considerable pressure leading to the cultivation of lands that are unsuitable for agriculture, while the average area of family plots has been reduced to 0.3 hectare. At the same time, the deterioration of the environment has spread, and the most obvious consequence, erosion, is increasingly threatening water resources and diminishing the productivity of land. Haiti faces a severe deforestation problem. In 1923 forests covered nearly 60 percent of the country; today they cover less than 2 percent. Until recently the government had done little to combat this problem. Because most Haitians still depend on wood and charcoal as their primary fuel source, energy alternatives are needed to save the forests. The 15-year Environment Action Plan, authorized in 1999, proposed to stop deforestation by developing alternative fuel sources. So far, however, political instability and lack of funding have limited the impact of this reform effort. Deforestation has led to soil erosion, which has decreased agricultural yields and resulted in deadly landslides. Urban environments suffer from a lack of sanitation. Vast slum areas, especially in the capital, Port-au-Prince, are filled with people living in squalid, unsanitary conditions. The border between Haiti and the Dominican Republic (D.R.) is more than just a political boundary. It also reflects the large amount of deforestation that has occurred on the Haitian side of the border. 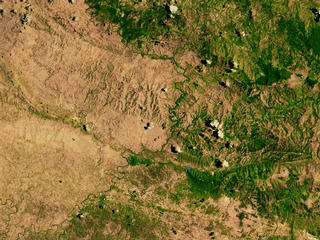 One can easily see from satellite imagery the lush forests still thriving on the D.R. side of the border, which is in sharp contrast to the Haitian side of the border. The country's serious weaknesses occur in a context of political instability and fluctuating rainfall in a country that is vulnerable to and ill prepared for weather-related natural disasters (in particular, the risk from hurricanes is very real). In August and September of 2008, Haiti was struck by four hurricanes and tropical storms in rapid succession: Fay, Gustav, Hanna, and Ike. The loss of life and the destruction of infrastructure as a result of these storms were devastating. The storms destroyed more than 22,000 houses and damaged an additional 84,000 houses. Almost all of the agricultural land in the country was flooded, causing more than $200 million in damage to the agricultural sector alone and exacerbating hunger throughout the country. The storms also damaged or destroyed roads, bridges and other essential infrastructure. The deterioration of the environment, deforestation and erosion aggravated by the widespread use of charcoal as a source of energy (70 per cent of national energy consumption) threaten water resources and agricultural productivity and considerably increase the country's vulnerability to the consequences of natural disasters. The consequences of unprecedented environmental degradation is also evident in the significant rural exodus and the resulting weakening of traditional systems of solidarity. A significant percentage of migrants have increased the already overpopulated slums which are increasingly unsafe and where living conditions and the lack of job opportunities keep people in a downward cycle of poverty and instability.